With summer warming up, it’s time to get outdoors – we have some great BBQ recipes, beach activities, refreshing beverage ideas and coupon savings for you and your family. Have you nominated someone from your community for an all expenses paid Caribbean Cruise including flights to Miami? If not, you only have till May 30, 2015 to do so. If you know someone who should be recognized and honored for their constant acts of kindness, generosity or volunteering spirit in your community, we would love to have you nominated for a 7 day cruise in the Caribbean. The cruise and flights are for two people so the nominated ‘celebrity’ can take a friend along as well. This is a great opportunity and we would be honored to have your local celebrities recognized for their amazing, genuine kind behavior they display towards others. Spring is the time of year when farmers begin planting. 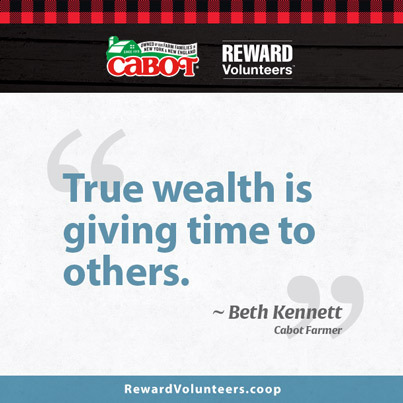 Please share Cabot Creamery Cooperative farmers’ spirit of spring and growth by logging the volunteer time you are giving in your community. Volunteering makes an important difference in our communities; it is truly a gift from the heart. Have you nominated a deserving community celebrity yet? 7-night, round-trip Eastern Caribbean cruise package for the winner and a guest of their choosing, on board Celebrity Cruises’ Celebrity REFLECTION. Airfare included, all expense paid cruise – all courtesy of Cabot Creamery Cooperative. Nominate someone today – nominations only open till May 30! Mother’s Day is just around the corner and we want to help you recognize the special Mom’s in your life. All the efforts that Mom’s go to, to keep you warm, safe fed and looked after is an amazing thing that is hard to, or possibly can’t be, repaid. Click through to find some great ways to celebrate Mom this year alongside sweet savings and many more tips. We would also like to take this moment to recognize all the people out there who have lost their Mother’s and also all the single Moms out there, your all amazing! Have an amazing Mother’s Day this weekend and we look forward to hearing about all the great stories and memories made. During National Volunteer Month, we’re reminded that volunteering is not only good for others; it’s good for you too. Studies show that volunteering contributes to both your mental and physical health by reducing stress and depression and encouraging physical activity, among many other benefits. Using Reward Volunteers can make the hours you spend serving others even more fun and effective. In addition to supporting them physically and mentally, volunteers get so much more out of serving their communities. Volunteering is a great way to meet new people. It’s also a wonderful way to pass your own skills on to others. Why not apply your work skills or home duties as a volunteer somewhere? Meet new folks and make a difference while doing good! Volunteers can use the time they give to others as a way of enhancing their own professional resume. All experience can be even more valuable to you and others..
Volunteering as a family is a great way to not only help your community, but also to model generosity and care to the next generation. Children who are volunteers grow up to be adults who donate their time to help others. Our friends at Cabot have a long history supporting community activism and involvement through a number of programs – Reward Volunteers (since 2012); The Community Celebrity Award Cruise (since 2010); The Cabot Community Tour (2012 and 2014). Through these programs, Cabot encourages volunteerism, honors dedicated volunteers for the work they do every day, and helps spread the message of the importance of volunteering. 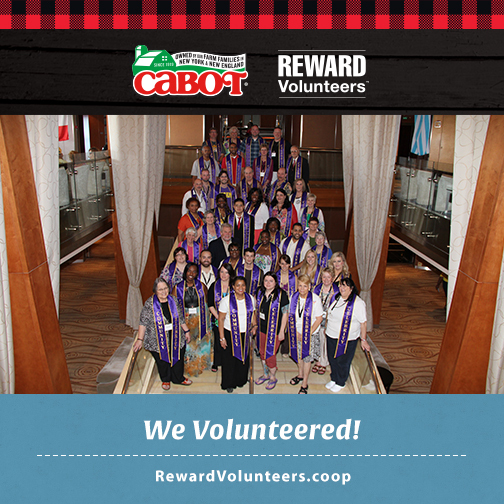 Along with their partners at Points of Light and All for Good, Cabot created Reward Volunteers to support and encourage volunteers by helping them to easily track the time they spend volunteering in their communities. They also want to reward them and the organizations they serve with prizes that include cash, vacations, gift cards, gift baskets, and more. The time is getting closer and closer to where we will be choosing a deserving individual for an all expenses paid Caribbean Cruise in November. Have you nominated someone yet? If your looking for a way to help recognize the amazing efforts of someone in your community, this is it…. And remember, if they get chosen, you could be going with them!! Nominate your Community Celebrity today by clicking this link!